In this tutorial, we will show you how to make 2-way switching connection. 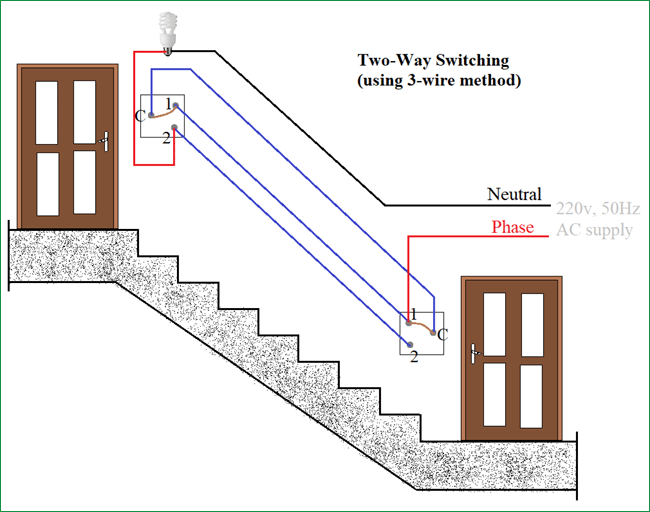 A 2-way switching connection means you can control an electrical equipment like bulb by two switches placed at different places, generally used in the staircase. Two way switch can be operated from any of the switch independently, means whatever be the position of other switch(ON/OFF), you can control the light with other switch. There are two methods of making 2-way switching connection one is 2-wire control and another is 3-wire control. We have explained both the methods below and both the methods are demonstrated in the Video given at the end of this article. This is the first method to make a 2-way switching connection, this is the old method. If you are going to install a new one then go for three wire control method. 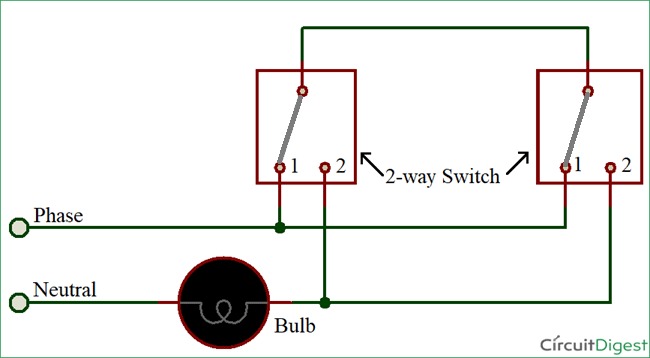 As you see in the Schematic Diagram of 2 way switch circuit below, you will find that the phase/live is connected with the common of the first 2-way switch. PIN1 & PIN2 of the first switch is connected with the PIN1 & PIN2 of second switch respectively. One end of the bulb is connected with the Common Terminal of second switch and other end of the Bulb is connected with Neutral line of AC power supply. Where, 0 represents the OFF condition and 1 represents the ON condition. This is the new method to make a 2-way switching connection as it is slightly different from the two wire control method. This method is commonly used now days as it is efficient than the Two Wire control system. As you can see in the Schematic Diagram of 2 way switch circuit below, the common of both the switches are short-circuited. PIN1 of both the switches are connected with the phase or live wire and PIN2 of both the switches are connected with the one end of the lamp. The other end of the Lamp is connected with Neutral line of AC power supply. Erroneous tripping of safety/circuit protection equipment. A big room having two entry/exit gate. To control any AC appliances like fan or light from two places like entry and exit. It's a age old logic but still a mesmerizing thing to people who doesn't belong to this domain. Thanks for explaining it so clearly. In the electrician's trade, the two switch location load control is termed a '3-way' system. The wiring schematic conforming to the adopted International Code Council requires a different physical configuration for safety compliance than what is demonstrated in this article. Thank you for this acticle. You solved a problem for me. Does anyone know how to do this with an led mech like the clipsal 30PBL? I'd like the mech led off when that switch is powering the light.